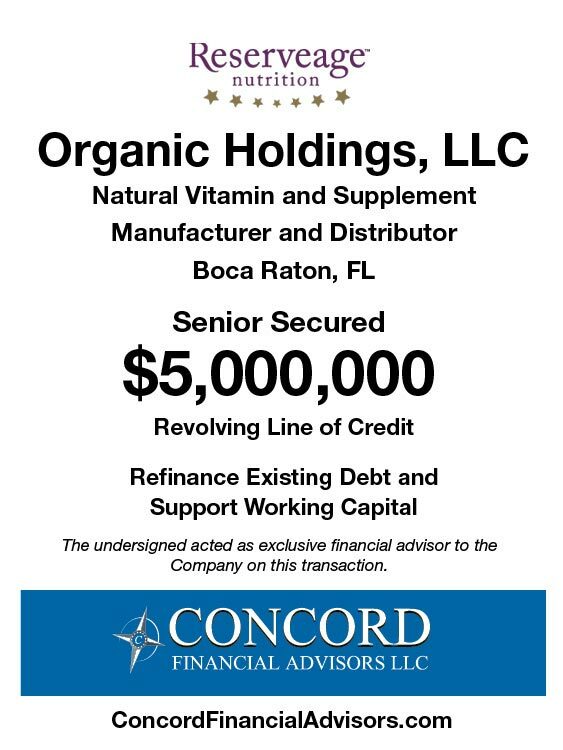 Organic Holdings, LLC, located in Boca Raton, FL, is a leading manufacturer and distributor of natural, nutritional supplements, vitamins, and healthy weight management products. The Company had been seeking a new banking relationship as its existing bank wanted to exit the industry. After being introduced to the Company, Concord quickly assessed that the Company’s core business was strong, well-managed and would be an attractive client for multiple bank or non-bank financial institutions. Concord created a detailed memorandum featuring the Company’s leading industry position, strong ownership/management team and impressive growth in profitability. Concord drew on its 14 years of experience and proven debt placement process to identify multiple bank and non-bank financial institutions that were comfortable with the industry. After conducting a targeted search process that generated multiple Proposals, Concord secured an attractive loan structure from a nationally recognized finance company that met all of the Company’s financing objectives.